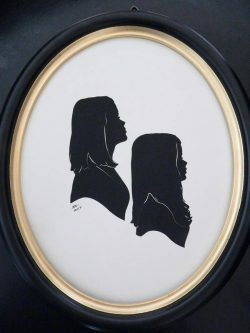 Renowned silhouette artist Deborah O’Connor will create individual portraits cut entirely freehand from paper, using scissors as her only tool, at the Wilton Historical Society on Saturday, December 8 from 12:00 to 4:00. Subjects pose for silhouettes, created in a matter of minutes, which they can take home–the perfect holiday gift, and a future cherished family heirloom. “Cutting silhouettes is basically drawing with a pair of scissors. The only difference is you can’t make any mistakes, as there is no erasing,” Ms. O’Connor says. First silhouette is $30, additional copies $15. Silhouettes are mounted on white or ivory archival quality cardstock. Mattes, extra copies for gift giving and frames will also be available. Silhouettes can also be made from photographs (in profile). Please call 203-762-7257 to book your reservation — a deposit is required. Deborah O’Connor is a Rhode Island native, and began cutting silhouettes over 30 years ago. Her silhouettes are cut entirely freehand from paper using scissors as the only tool. A self-trained silhouette artist, O’Connor attended the Boston Museum School studying painting and drawing. After spending a year working at Disneyland’s Silhouette Studio in Tokyo and in Maui and New York, O’Connor now lives in Rhode Island. She is one of only a handful of silhouette artists still practicing the craft. Silhouette portrait sittings are part of Holly Jolly weekend at the Society, which includes a visit from Santa (11:00 – 2:00) and pomander making and gingerbread men decorating (11:00 – 1:00), plus Songs with Santa by Music on the Hill, 2:00 – 4:00 in the barn, as well! A popular alternative to expensive commissioned oil portraits in Europe during the 1700s, the art of silhouette cutting reached its “golden age” in the 1800s. With demand high, many European silhouette artists immigrated to the United States. Those catering to American politicians and the very wealthy became famous and prospered. Others traveled to county fairs and small towns capturing the profiles and hearts of countless thousands of ordinary folk as silhouettes became a popular way of recording an individuals’ likeness, as well as a practical way of keeping family records. Considered a precursor to the modern-day portrait photograph, photography eventually supplanted the art of cutting silhouettes. Today very few silhouette artists remain.